Some would believe that remaking classic horror movies from the previous eras can get effectively reinvented for a more modern audience. This is not always the case though, as it is hard to replicate or outdo the impact, style and originality of its predecessor, even though the technicalities of the remakes can often improve upon the original - but the grainy, gritty look of these movies (like Texas Chainsaw Massacre) is part of its legendary character. 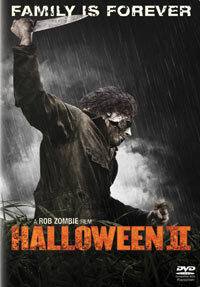 I had great expectations for Rob Zombie's remake of the first Halloween, but it didn't do much for me (although the addition of Michael Myers' deterioration into madness as a child at the asylum was a nice touch). This sequel unfortunately had a similar overall effect – one of “they needn't have bothered”. With a bit of a fun trick Zombie picks up the story on the night the first film ended with Laurie Strode surviving the carnage. Michael is far from dead and escapes the hearse. Some time passes however, enough to have Dr. Loomis doing a tour with the book he had written on his disturbed life-long patient Michael Myers, and his notorious Haddonfield killing spree. The tour is heading to Michael's home town (as is he), but in the pages lie something crucial which will affect the surviving Laurie. In this remake the character of Dr. Loomis is also far less sympathetic (than that portrayed by Donald Pleasence in John Carpenter's unbeatable original movies) as he'd turned into a celebrity-hungry author. As with the first remake, I feel the sequel wasn't a necessity, but for the most part a new teen audience want things to have today's sheen as opposed to the actual time period of the originals. No extra features on this South African release.